inequality 1:a = (1-ZGini)/(1+ZGini) is the SOEP "equality parameter"
these are hostile to each other. (1) This calculus follows the notation used in the calculus from Lionnel Maugis (1996). (2) In this calculus N only is used as upper limit for the index of Σ. (3) Usualy I use the %-format for normalized measures. (4) The formulas for grouped data yield mimimum values because the inequalities within the quantiles are not evaluated. Higher granularity (division of a population into more quantiles) usualy also yields higher inequalities and higher redundancies. Entropic inequality measures like Theil's entropy actually are not entropies. They are redundancies. The redundancy of a system at a given time is the difference between its maximum entropy (e.g. Theil: ln(Atotal/Etotal)) and its present entropy (e.g. Theil: Σi=1..N(Ei*ln(Ai/Ei))/Etotal[a]) at that time. In a system a certain amount of transformations is possible. The sum of transformations, which already have occured, cannot be reversed without help from outside. Entropy is a measure for how many transformations already have occurred in that system. The redundancy serves as a measure for how many transformation opportunities still are available. If completely equal distribution (of whatsoever) in a system leads to maximum entropy of that system and if low entropy of that system is caused by high distributional inequality, then achieving equal distribution means that the distribution process is saturated. In that case a relative equality measure can be defined using the term e-R, where R is the redundancy (the remaining distribution possibility) of the system and e is Euler's constant[b]. As for the relative inequality, Z=1-e-R applies. In this text, "symmetric" does not stand for invariance under permutations of individuals. Rather, I define inequalitiy measures as being symmetric, if Z(E|A)=Z(A|E); and redundancies are symmetric, if R(E|A)=R(A|E). Gini's, Hoover's and Coulter's inequalities are symmetric. Theil's redundancy and Atkinson's inequality are not symmetric. Therefore the symmetric inequality Zsym has been introduced: It simply is derived from the symmetric redundancy Rsym which is half of the sum of Theil's redundancy ZTheil(E|A) and Theil's redundancy with swapped data ZTheil(A|E) . You may interpret redundancy as a measure for distributability of resources. (Whether redundancy is "good" or "bad" usualy depends on who benefits from it and who controls it - which usually is the same.) For living systems (individuals, societies) redundancy is the distance between life and death. Applied to Plato's two-quantile-societies, the formulas for Plato's, Gini's and Hoover's inequality yield similar results. Also the formulas for the Symmetric redundancy and Theil's redundancy yield similar results. The Plato inequality behaves almost like the Gini inequality, as the blue "cluster" along the diagonal line in the graphics below (next paragraph) shows. But as an advantage over the Gini inequality, the Platon inequality can use the full range between 0% and 100% independently from the amount of quantiles. The computation of the Plato inequality can be done by recursive iteration. The procedure is implemented in the on-line calculator attached to this site. The recursion quickly will yield a result with any precision you need. From the wild wild west: A foreman in a railway workers camp used to kick his Chinese servant after the servant served the morning coffee. One day a fairy visited the foreman in his dream and told him, to stop the abuse and to increase the servant's salary. Otherwise he would burn in hell for ever. The next morning the foreman told the servant, that from now on he will treat the servant with respect as well as with a much higher salary. No kicking anymore. "That is interesting." the servant answered, "This night a fairy visited me in my dreams and told me to use water again for your coffee." Once trust in fairness is lost, seemingly powerless minorities will find ways to compensate for their weakness. But what is a "fair distribution of ressources"? The decision is normative, there seems to be no natural law available which could help us here. But an indicator which detects fury can help to make the right decisions. (Common sense could be a good detector too. But too often denial gets in the way.) By means of modern technology those, who are reactively devaluated as "losers" by the winning majority, still have a significant impact. Their approach may be cowardish and destructive, but it works as threat against the winners nevertheless. States with complex infrastructures will turn into failed states if they underestimate the leverage of marginalized minorities. By absolute numbers, these "minorities" still are several millions of angry people. Unfair distribution of wealth (wether factual or alledged) leads to fury (aggression). The market turns into a battlefield. On the other side people do unterstand, that guaranteeing the same income for everyone also means, that there must be some artificial control of income distribution which also deprives them from the chance to increase their income by increasing their contribution to society. Equalitarian control attempts to close the battelfield, but it also closes the playfield. Therefore the majority of people expect (negative aggression) a certain inequality of distribution but reject (positive aggression) inequalities which they consider to be extreme. 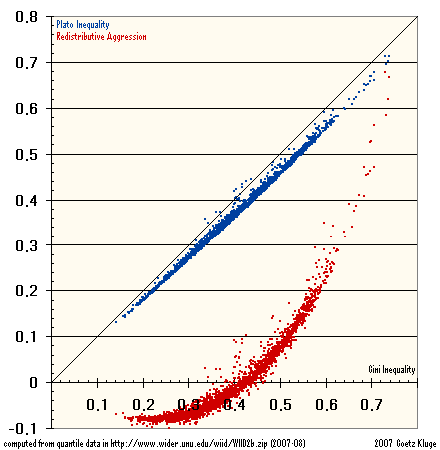 There is an inequality measure which takes care of the fact, that aggression against inequality can be positive and negative: The Redistributive Aggression is defined to be the difference between plain inequality weighted by perception (the Symmetric redundancy) and the unweighted plain inequality (the Hoover inequality). This aggression measure is a social entropy measure. Or you interpret it as a redundancy measure for those to whom redistribution is a business. And if "aggression" sounds too emotional, you also may call the measure Inequality Issuization. For Plato's two-quantile-societies given above, a Gini inequality of 0% for incomes can be associated with a total standstill, but at 25% you feel like in Scandinavia and would tolerate even higher inequality without envy. Above an income inequality of 40%, people compete in the tougher British, German and American ways: Friendliness becomes "professional" and ritualized, the robot on the phone calls you a "valuable customer". In these societies people had to learn to give aggressiveness a positive connotation. But a society with a income inequality of above 60% usually will be known for corruption, crime and bloodshed. Once the income inequality would exeed 80% and/or the Redistributive Aggression would go beyond +1, probably plain terror would rule the relation between Plato's poor city and rich city. The Redistributive Aggression measure offers a way to indicate a range of inequality, which people not only tolerate, but even may appreciate. The question is not about whether or not to tolerate inequality. It is about the degree of inequality. The playfield is marked by negative aggression, the battlefield is marked by high positive aggression measures. Above a certain range, inequality leads to increased hostility. Klaus Deininger and Kihoon Lee from the World Bank and Lyn Squire from the Global Development Network provided updated data from the real world to the World Income Inequality Database (WIID) in May 2007. Let us look at processed data (also free download from LuaForge: quick&dirty hack for the scripting language Lua) from that database in order to draw the the range of the Redistributive Aggression (red cluster) and the Plato inequality (blue cluster) plotted over the Gini inequality. From that plot it becomes clear, that the measure for Redistributive Aggression could be an interesting alternative to other existing inequality measures. Below a Gini inequality of 40%, most of the values computed for the Reactive Aggression are negative. 1960: The poorest 20% of the world's population only had a share of 2.3% of the global income. The top 20% of the world's population earned 70.2% of the global income. 1998: The poorest 20% of the world's population only had a share of 1.2% of the global income. The top 20% of the world's population earned 89% of the global income. After 38 years of globalization income inequality grew significantly, especially after 1980. Associated with growing income inequality is the redistribution of more power to less people. The result is concentration of power - as long as power is mainly determined by economical power. The response to that development is to return to times where power is linked to violence. This is happening right now. Tough, but simple: For any distribution and consumption of ressources you need ressources. 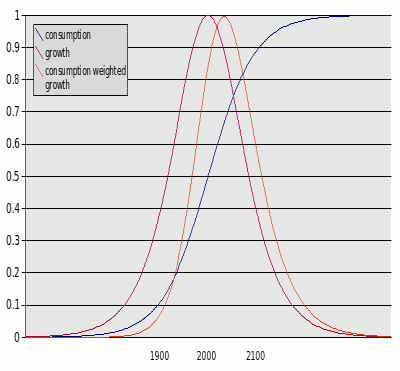 Thanks to human ingenuity and with more or less miraculous help from substitution, the consumption (blue: logistic function) may grow "forever", but the growth (red: derivative of logistic function, normalized to 1.0) of consumption may not grow forever. If betting on small growth at a high level (orange: logistic function weighted by its derivative and normalized to 1.0), then you just postpone the trouble which can be expected for a growth driven global economy. There are many ways for mankind not to get trapped in following the logistic function, however, only a few of them will make progress pleasurable. We moved into the wrong direction already: Our biosphere is an open system, but the openess is limited and we even started clogging its interfaces required for entropy export. Nevertheless, matterless systems still could grow, e.g. religions for the masses ruled by a small and scared elite under permanent threat. The soil for these matterless systems would be humans and their competition for distribution of matter. Interpreting that as the purpose of humans could be a religious assumption already. Perhaps the most lucid book ever written about economics is The Economy of the Society by Niklas Luhmann. Almost like an alien landing on earth, he finds, explores and describes matterless systems which thrive on matter made up from humans and their societies. One of these systems is economics. It exists and prevails, because accidentially it found ways to exist and to prevail in its environment by autopoetically reinventing itself as long as its environment (humans and their ressources, to which economics is "structurally coupled" and which economics only can sense once the signals from that environment are expressed in terms of money) permits such a permanent autopetic reproduction. Today, Luhman perhaps would come up with The Terrorism of the Society (written in his ususal Aspergerian style which seemingly is too much for translators to deal with). In systems theory, terrorism probably would be one of the smartest systems thriving on our society. I don't write that in order to get blacklisted by the CIA or the German Verfassungsschutz. I write this in order to ged rid of this self sustaining system. Terrorism (whether from arms traders, "religious" fundamentalists, from organized crime, from drug barons, from dictators or from whomsoever) has autopoetically developped the ability to feed on the fight against terrorism and its collateral damage. The most nutritional value provided to the food for Terrorism is the fight against the symptoms of terrorism and against the means of terrorists: Such medicamentation just creates new symptoms and new means. Secondly, terrorism has managed to prevent us from fighting its causes. It even prevents us from thinking in a pragmatic and problem-soving manner about its causes. The trick is simple: We believe, that terrorists would win once we allow them to force us to have a closer look at the causes of terrorism. So by all means we we don't allow terrorists to succed in making us think really lucidly about its causes, even though imposing such an ignorance on us turns us into losers. This mistake allowed terrorism to become such a powerful and selfenforcing disease. It would be too simplistic to identify a too high (and still increasing) distributional inequality as the single reason for terrorism, but as an exercise it may be smart to at least start thinking about the high global distributional inequality as well as high regional inequalities as being one of the drivers of terrorism. We may discover, that the wasted investments gobbled up by useless medicamentation against terrorism could be used more efficiently when attacking the root causes of terrorism. It was not a terrorist sympathizer who tried to hint to causes of violence by postulating "A perceived sense of inequity is a common ingredient of rebellion in societies ..." It was Amartya Sen who wrote that already in the year 1973. The symmetrized Theil redundancy is equal to (or larger as) half the sum of the product of the perceptions and inequalitys of all subgroups in a society. The higher the redundancy (the lower the entropy), the more people want their share of this redundancy. Instead providing a lightness of wellbeing, we fight. Terrorism uses bombs and germs, but its objectives it achieves thanks to the countermeasures of the winners in fencing off the losers. There goes all democratic freedom, all that wonderful lightness promised by progress - and that is how terrorists win. The collateral damage (from loss of lifes to the destruction of freedom and democratic achievements) caused by the "war against terrorism" is a means of terrorism. Terrorism survives and thrives on us as its soil because it successfully cought us in the trap of a paradox. The solution is to fight against terrorism by turning that paradox against terrorism: Extinguish terrorism by allowing it to be successfull in forcing us to attack its causes. Too high inequality (which is, as annother challenge against common sense, too low entropy) may be one of them. But what is "too high" inequality? Statements like the one above suffer not only from the lack of explanation how the Gini inequality was computed. You also want to know the sources. One approach is to look at the WIID database and to check, which countries are known for social unrest and what inequality measurements you get from these countries. Then you probably will agree to Liu Binyan's and Perry Link's statement. And I think, that also the redistributional aggression measure, which I introduced previously, matches with the realities found between Scandinavian welfare and Latin American redistributional violence in the countries of the WIID database. Yoram Amiel and Frank Cowell let students make judgements on sample inequalities. 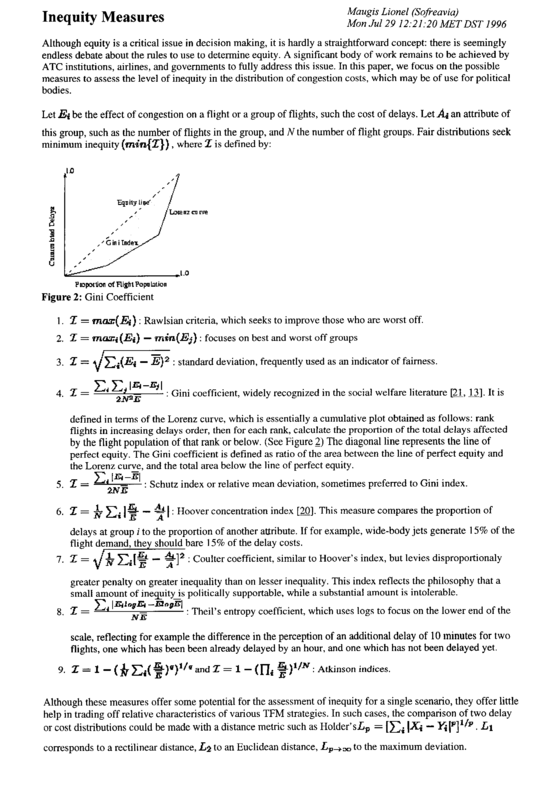 They "calibrate" inequality measurements empirically and also analyze, how the properties of inequality measures (anonymity, scale invariance, translation invariance, scale independence, translation independence, population principle, transfer principle and decomposability) are related to such judgements. This research gives sense to inequality measurement. Does the growth of inequality stimulate economic growth? The World Bank shows, that inequality and growth are not related. Inequality neither drives growth nor does it impair growth. Other Research (W.Kitterer) also shows, that in perfect markets inequality does not influence growth. In real markets redistribution contributes to growth. Which Purpose does Measuring Inequality have? Afraid of inequality measurement? In around 1998 German polititians quarreled about the importance of statistics on poverty and wealth. Quite a few like Wolfgang Kubicki from a libertarian party (FDP, press release 220/98, Kiel 1998-09-04) fought against such an measurement, as in their opinion such an inequality issuization would lead to "social jealousy". How about measuring the degree of jealousy and inequality issuization first? Indicator for quality of life: As already proposed in "From Numbers to Meaning", analyze the purpose of measuring inequality yourself: Look at societies where you would like to live, and look at societies where you would not like to live. Try to find out, whether - besides other indicators for sustainable development (Hartmut Bossel, 1999) - there is a degree of inequality, which is "comfortable". Diversity analysis: Inequality measures are concentration measures, which are not only used in welfare economics. As an example, banks use such measures (e.g. " Gini coefficient and Shannon entropy measures") in order to to analyze diversity in loan portfolios: The higher the concentration, the lower the diversity and the higher the risk to which a loan portefolio of a bank is exposed. Redistribution measurement: In many countries income taxation is progressive. Discussions on "equalizing" differences by tax progression sometimes get quite noisy, however, the results of tax progression e.g. in Germany do not make such a big difference. You can measure that difference simply by looking at the ineqaulity if income distribution before and after taxes are deducted. In Germany income tax (2001) decreased the the Hoover inequality by just 3%. Alternative to the median: One usefull application in welfare economics is the application of inequality measures to the computation of the welfare function. That measure can replace the median as an indicator for the average income perceived by the largest part of a society. A liberal and a conservative were sitting in a bar. Then Bill Gates walked in. "Hey, we're rich!" shouted the conservative. "The average person in this bar is now worth more than a billion!" "That's silly," replied the liberal. "Bill Gates raises the average, but that doesn't make you or me any richer." "Hah!" said the conservative, "I see you're still practicing the discredited politics of class warfare." The total income of all people (including Bill Gates) in that bar devided by the head count of these people is not what most of them earn as their per-capita income. Traditionally the median is used to represent that income. Alternatively you multiply the arithmetic per-capita mean income by (100% - inequality). The result of that simple computation is the welfare function. Amartya Sen used the Gini inequality. You may try the Symmetric inequality and the Plato inequality as well. Whatever you take, it is as much a political decision as choosing the median as a reference. In contrary to the "Gini index", Entropy is a natural measure. The Gini inequality is computed from a graphical construction (the "Lorenz Curve"). That seems to be easy to understand "intuitively". But where ist the relation between that nicely visible drawing and the impact of inequality, which is the ratio of two areas in that drawing? Intuitively, though, Gini may have created an good indicator nevertheless, as its closeness to the Plato inequality shows. The weakness of the Gini measure is its failure to help detecting deprived minorities. Back to entropy: The redundancy of a system at a certain time is the difference between its maximum entropy and the actual entropy of that system at that time. If both entropies are the same, the system has reached a state of equilibrium. (Only help from outside could get it out of that state. That help would allow the system to "export" entropy.) The lower the entropy within the system, the bigger is the distance to equilibrium and the more activities are possible in the system. In physics and information theory entropy is a measure which can be used in the real world to compute the impact of the distance to equilibrium. If you are used to the range of the Gini inequality, you may consider to give the Plato inequality a try. The exact computation of the Plato inequality needs iteration, but you can avoid correction attempts like "normalizing" the Gini depending on the amount of quantiles. Coulter has collected about 50 inequality measures. There probably are a few more. In my calculus you find a collection of selected measures and three "own" ones (1995: Symmetric (then erronously attributed to Kullback-Leibler, better call the redundancy symmetrized Theil redundancy and call the Symmetric inequality symmetrized Theil inequality), 2004: Plato, 2007: Redistributive Aggression). Which one to use? As complexity of computation is no criterion anymore, mainly the significance of an inequality measure determines its importance. Simplicity: The simplest inequality measure is the Hoover inequality (also known as Robin Hood Index). It also is the least interpretative one. Popularity: But the most popular measure is the Gini inequality. Compute it together with the Plato inequality, which is a pseudo Gini inequality. If the Plato inequality is very different from (e.g. much higher than) the Gini inequality, then you may want to check your quantiles for mistakes or for unusual data. Entropy: I favorize entropy measures. To users of the Theil redundancy (usually called Theil index) I recommend to evaluate the Symmetric redundancy (symmetrized Theil redundancy) as an alternative. It is almost as simple, as the Hoover inequality. Substract the Hoover inequality from the Symmetric redundancy in order to compute the Redistributive Aggression (alternatively called Inequality Issuization). All those indicators are just that: Indicators. They cannot replace reality. These indicators are used to simplify and model reality in order to return to reality with explanations, predictions and decisions. In many cases the meaning of the indicators will be disputed. But especially in a time series, indicators with decreasing or increasing values will make you curious to understand change and the impact of change. My favorite solution would be to use the Symmetric redundancy. You may hesitate to use this measure, as it theoretically does not have an upper bound. How to interpret values above 100% (above 1)? It is simple: The Symmetric redundancy is 100% for distributions, which are entropywise equivalent to the distribution in a 2-quantiles society of 82:18. That is very close to the "Pareto principle" (80:20). Values below 100% indicate that you are below that "popular" distribution. Values above 100% indicate, that you are above. Use the Symmetric redundancy together with its relative (with regard to the similarity of the formulas) the Hoover inequality (is 100% at maximum inequality). If you prefer all measures to stay between 0% and 100%, then use the Plato inequality (pseudo Gini inequality) instead of the Symmetric redundancy. Also try out, how helpful the Redistributive Aggression (Inequality Issuization) is to you. How much should children be affected by distributional inequality? Does increased wealth for one subgroup and unchanged wealth for the other subgroups affect the distribution of power within the group? What is the relation between social entropy and economic entropy? [a] The term ln(Ai/Ei) is the unweighted entropy of the quantilei. Coming from information theory and if A stands for owners and E stands for ressources, then this term can be interpreted as minimum length of the address required to distinguish the owners A per unit ressource E within their quantile. (The base of that length is Euler's constant e. For other bases b you need to devide the entropies by ln(b), e.g. ln(10) or ln(2).) In order to determine, how much entropy this term contributes to the whole system, the term has to be weighted by its share of E, that is Ei/Etotal. The sum of the share weighted entropies is the actual entropy of the system: Σi=1..N(Ei*ln(Ai/Ei))/Etotal. If all Ai/Ei would be same, the entropy would be ln(Atotal/Etotal), which is the maximum entropy of the system. - As you see, the Theil index (Theil redundancy) is normalized by the ressource unit: E appears as devider. You can read that as "per ressource unit". Now supply siders can start to discuss with demand siders about this property of Theil's index. Alternatively one can use an index which is normalized to a single owner. This is what I call the "liehT redundancy". As in the real world distribution between owners and ressources is mutual, the truth is between both redundancies. That is why I came up with the "Symmetric redundancy". Or call it "symmetrized Theil redundancy". The result is almost as simple and clear as Hoover's inequality. [b] Euler's constant e≈2.71828 has the property dx/d(ex)=ex. To economists that number may look like having originated from physics. Although Euler's constant is very important for physics and first was published by Leonhard Euler in his Mechanica (1736), it was economics where the first few digits of the number were found. Jacob Bernoulli (1654-1705) wrote these digits down when analyzing compound interest, where growth in one step is split into many little growth steps. If the steps become infinitely small, growth is continuous. Examples for an annual interest of 100%: (1) Stepwise growth: 1 Euro grows to 2 Euros in one year if compounding occurs at the end of the year. (2) Deviding one growth step into many little growth steps: 1 Euro grows to about 2.71457 Euros within one year if compounding occurs daily. (3) Continuous growth: 1 Euro grows to about 2.71828 Euros within one year if compounding occurs continuously.